I am an Air Force brat, an Army spouse, a graduate of USMA, and a homeschooling mom of 2 daughters. I was a gymnast through high school, and a cyclist and triathlete in college and beyond. I have always had an interest in fitness and nutrition, but finding CrossFit changed my thought process of what fitness really is—it isn’t a certain body weight, or percent body fat; it’s about being able to perform functional movements for the rest of my life. 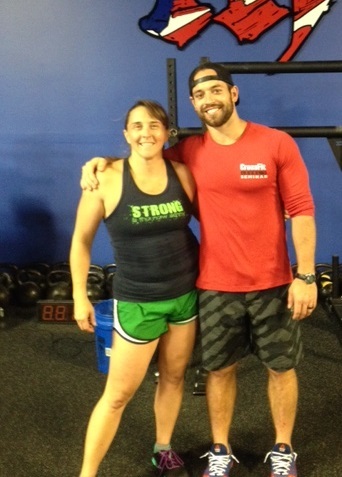 I started doing CrossFit regularly in Dec 2012 and received my Level 1 certification in June 2014. I also hold CrossFit Mobility Cert and CrossFit Kids. I am an avid competitor and will always strive to go harder and become stronger, but I truly believe that CrossFit is beneficial for life-long health and wellness and I am passionate about sharing that opportunity with others.